» ein Buch, un livre, a book ! ein Buch, un livre, a book ! Some of you might have noticed that I neglected this site a little recently. However others of you might also remember that some time ago I vowed to come up with new stuff. Well, the time has finally come to reveal what the prolonged silence was all about. I have written a book! 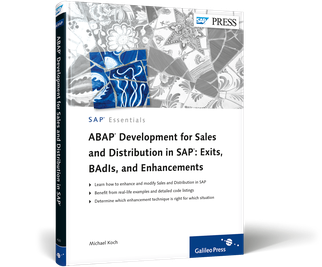 Back in October 2011 I began talks with Kelly Harris of SAP Press about a technical book for the Sales and Distribution (SD) module of SAP ERP. A lot of emails went to and fro across the Atlantic, discussing content and format, but by Christmas 2011 I started writing. If you are a beginner to intermediate ABAP developer, functional SD consultant, application architect or involved in a SD project then this is the book for you. In a real-world approach, it will introduce enhancement methods to you and compare them, so you understand the pros and cons. With this book I am hoping to give consultants a better understanding of the enhancement process (how to find enhancements, choosing the right method, implementing them properly). You can pre-order the book now from the SAP Press online store, but I’ve been assured that there will be many ways to get hold of it once it has been published. There’s a lot more to report, especially on the process of writing. Once published (October 2012), I will talk more about the book and how it came about. This entry was posted in ABAP, ABAP for SD book. Bookmark the permalink. Looking forward to taking a look Michael, I have no doubt it will be good! Congratulations on the arrival of your new ‘baby’ (I know, it took longer than 9 months…).